Facebook and Instagram began simultaneous rollouts of their new time management tools on Wednesday. Research has found that more time spent on social media results in users feeling worse about themselves. A survey released last year by Deloitte revealed that people are checking their phones 47 times per day on average. Instagram's Product Director of Well-Being, Ameet Ranadive, said at a press briefing on Tuesday that "When people use Facebook and Instagram, we want to make sure that they feel good about the time they've spent on the platform. A big part of that is making sure that people are in control of their experiences and they can be mindful and intentional about how they're spending their time, how much time they're spending, when they engage, how they engage." One of the new tools that have been unveiled is a dashboard that tells you how much time you've spent on Facebook or Instagram that day, plus a daily breakdown of time spent over the past week. Another feature is the ability to disable push notifications for anywhere between 15 minutes and eight hours. 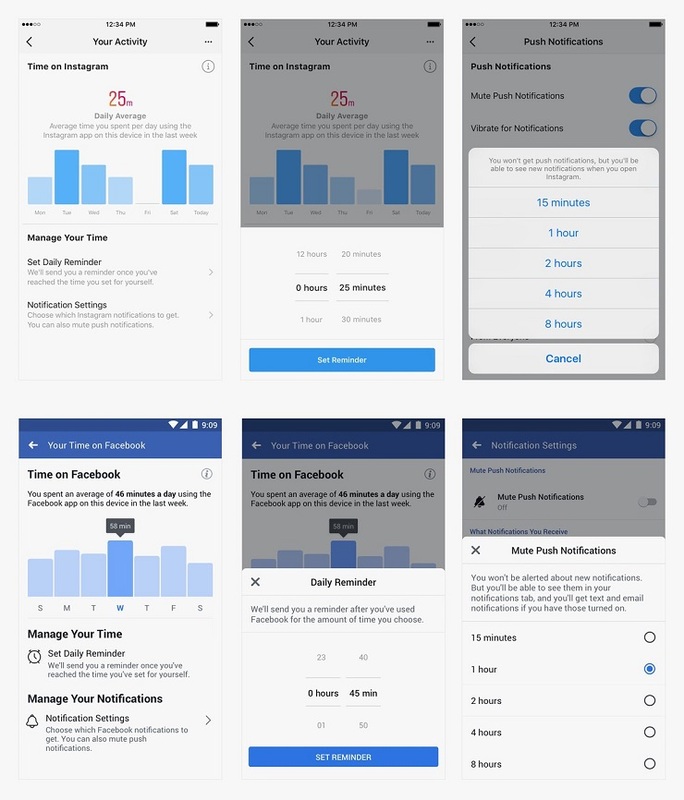 Facebook and Instagram users will also be able to set a daily reminder that they've been on the app for the time limit of their choosing, thus encouraging them to get off the app. In May, Google introduced time management features for Android devices as part of their "Digital Wellbeing" initiative. A month later, Apple announced that iOS 12 would help you monitor how much time you spend on your phone and on certain apps and allow you to set time limits for using your phone. While these tools can certainly prove insightful for users, in the end, it will be up to the users themselves to decide what to do with the information and whether they will actually close their apps and put their phones away.